Respected peace-loving American dignitaries, ladies and gentlemen, I extend my warm greetings and gratitude to all of you for coming here this evening. You are now joining more than seventy million people worldwide, including seven million in Korea, and seven hundred million Blessed couples in the heavenly spirit world who have participated in these gatherings for peace. We are living in a truly historic and providential moment. This is a time of great heavenly fortune, the time when we will build the ideal world of peace that heaven and earth have longed to see for six thousand years. It is time to build the kingdom of God in heaven and on earth. Throughout providential history, God raised up various religions to accord with different historical periods and regional cultures. Working among these diverse traditions, men and women of faith have made continuous efforts to achieve a world of peace. Yet even today, human beings groan in travail, because we are still unable to free ourselves from all manner of unethical and immoral behavior. People everywhere are dismayed by the truth that a seemingly unstoppable tide of immorality is now rushing in with the power of a surging storm, threatening to sweep us all away in its turbulent waves. This is the tragic portrait of modern human beings. Yet this does not mean there is never to be any hope. My husband, the Rev. Sun Myung Moon, and I have dedicated our lives to conveying the Word of God. Our prophetic messages have been proven to be a true witness that transcends the earthly limitations of this age and our environment. Dear precious and beloved brothers and sisters of Japan! Minasan Konnichiwa! What a breathtaking inspiration it is to be here today. It is truly an honor to stand on this stage in the presence of 12,000 providential champions who absolutely attend our Heavenly Parent and True Parents. It is no coincidence that we celebrate this day in Tokyo, Japan with our eminent True Mother on the official Mother’s day holiday. Our mother nation of Japan has been our movement’s true model of “hyojeong” attendance, its beloved sons and daughters living for the sake of the world! There is no doubt in my mind that we are here with Heavenly Parent’s and True Parents’ absolute blessing, admiration, love and grace. 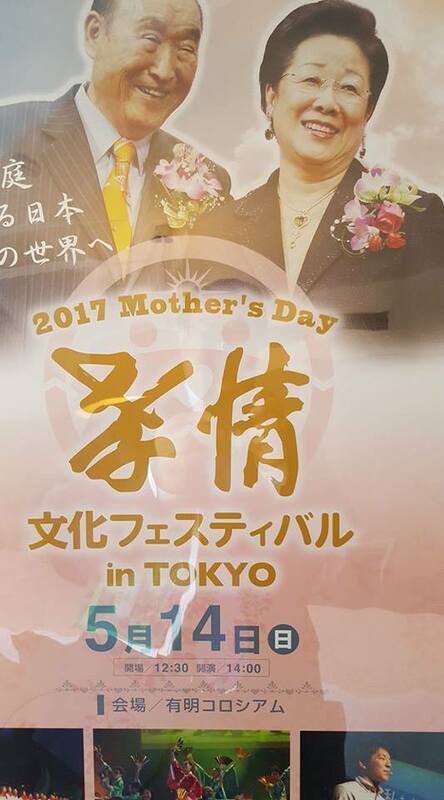 What makes this day so very memorable and inspiring is the fact that the greatest mother of all time, our one and only beloved True Mother, has come to Japan to be one with our Japanese family. Aju? True Mother comes here to share her loving heart and to convey encouragement, absolute faith, confidence, and hope that our mother nation of Japan shall be victorious in fulfilling Vision 2020. We are truly blessed to be here today in the Mother nation, celebrating this “Mother’s Day”, as one united family under God with our beloved gorgeous True Mother! Yes! Aju? We have learned from our True Parents that God, our Heavenly Parent, has both masculine and feminine characteristics. While we refer to God as Heavenly Parent, to indicate a single, unified entity, we understand that at the very source and origin of our universe there is also the heavenly mother’s heart. We know that the substantial manifestation or incarnation of the Heavenly Parent cannot be achieved fully through a single masculine or feminine being. Heavenly Parent and the world have been waiting for the victory of True Parents. Without True Parents there would be no completion of the 4 position foundation. True Children and Blessed Central Families would be an impossible dream. Without True Parents there would be no salvation, grace or blessing and we would all still be in darkness. We must carry the absolute heart of “hyojeong”, a true filial heart, and live in complete gratitude to True Parents with absolute love, faith and attendance. We must be the proud sons and daughters of our Heavenly Parent and True Parents and bring this world to the light as One Family under God. For 92 years this world was so deeply and profoundly blessed to have our True Father, prepared by heaven as the only begotten son and called by Jesus, walking this earth, traveling this world, and unceasingly speaking the complete truth of heaven. And, for the past 74 years this world has been equally and most profoundly blessed by the presence of our True Mother, prepared by heaven as the only begotten daughter, and as the long awaited bride that completes the position of True Parents, standing in the position that had been lost at the time of the Fall. Humankind has existed from the beginning without its True Mother. We have lived in utter darkness and suffering for millennia. If you reflect on the history of our world we observe that there has never been a completed, center point that harmonized all life and creation. True Parents—True Father and True Mother—are that absolute and eternal center point. For 52 years on this earth, True Mother served as the True Wife and the True Love Partner to her Husband. Over a period of 20 years, she gave birth to 14 beautiful and precious true children, establishing the True Family here on earth. Together, as one absolute perfected couple, our True Parents have fulfilled and completed everything so that humanity could achieve total liberation. Since True Father’s passing four and a half years ago, we have witnessed the emergence of our True Mother in ways that exceeded all our expectations and dreams. We are truly blessed to have our True Mother with us. From the time of the Holy Wedding in 1960, she worked side by side with our True Father every single day. Is there anyone who can claim to know True Father more than True Mother? Can any child fathom the full essence and depth of the parent? Only True Mother knows the deepest heart and soul, the tears, the longings, the hopes and dreams, of our True Father and our Heavenly Parent. Indeed, it is that absolute complete oneness with Heavenly Parent and True Father, day in and day out, that inspires and guides our True Mother as she leads our movement forward to victory. On this day, I am sure that True Father is filled with infinite happiness and comfort to see our True Mother here in the Mother Nation of Japan. Although True Parents often pushed our Japanese brothers and sisters time and time again to fulfill incredible goals, True Parents have the greatest love, respect and gratitude for our Japanese members. The mother nation, like our True Mother, gave everything to complete the providence. By gracing this event today with her presence, True Mother is giving us the ultimate divine blessing and sacred honor. This day will be recorded eternally as a turning point in the providence centered on Japan, a day of greatest blessing for the mother nation as you move forward to achieve victory in fulfilling Vision 2020 and establishing the nation of Cheon Il Guk! I am confident that Japan can do it! Are you confident? Can you do it? Yes? Aju! Brothers and sisters, we have such a precious opportunity on this day, to hear directly from our True Mother. We have come together on this day as one family under God, centered on our beloved True Father in heaven and our beloved True Mother in Japan. This is the day of glory, the day of cosmic spring, a day of infinite blessing and eternal joy. Now, the moment we have been waiting for is to welcome our beloved True Mother onstage. We will have a ceremony to offer flowers of appreciation. Let us rise together and let us give our deepest, most powerful and most loving welcome to our beloved True Mother. True Mother's World Speaking Tours. 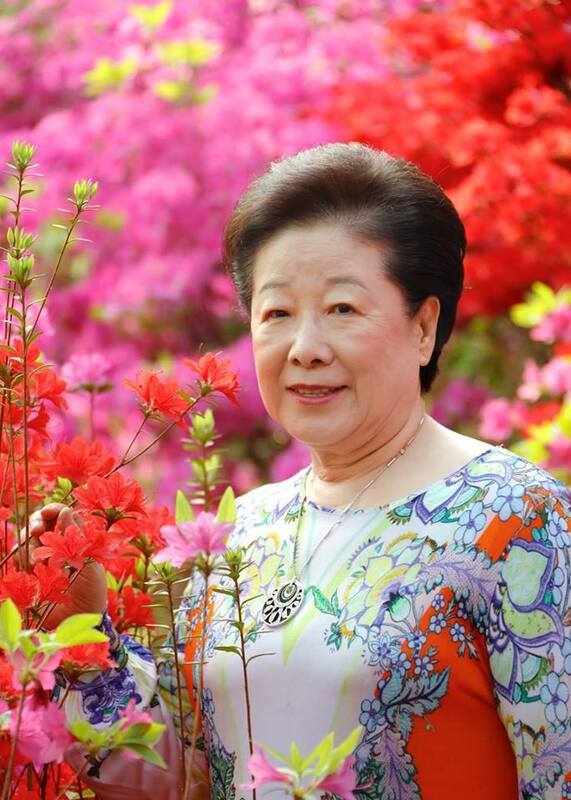 At KINTEX exhibition center in Goyang City, in an event hall the size of a huge aircraft hangar, True Mother today encouraged a crowd of 10,000 members, ambassadors of peace and local leaders to follow the way of love and peace building. The event was one of four or so events to be held throughout Korea in the ensuing weeks, on the same theme. They will be followed up with smaller events geared to helping leaders in Korean society strategize for the path ahead for their country. After Korean Family Federation president Rev. Yu Kyeong-eok, who was MC for the event, welcomed everyone warmly, he spoke on some of the issues facing Korea – including the threat of North Korean military action and the political turmoil of recent months – and introduced some of the prominent guests in attendance (which included the Mayor of Guri City). The event featured speeches by two Korean lawmakers (and a message from a third). The first among these, Mr. Jo Myeong-cheol, had previously taught in Kim Il Sung University in Pyongyang before defecting to the south. He had been present when Father was in North Korea and when he declared that North Korean Juchephilosophy was never going to lead to unity. Mr. Jo testified based on his first-hand experience that no one else had ever dared to say such a thing in a public forum in North Korea. He admired Father for risking his life to say those words. The second lawmaker, Mr. Kim Seong-dong, recounted how Father had worked tirelessly for South Korea’s security, and he looked back to the Rally for Korea Freedom in Yoido, Seoul, in June 1975. He also mentioned the landmark visits True Parents made to meet Mikhail Gorbachev in Moscow in 1990 and to meet Kim Il Sung in Pyongyang the following year. He exhorted all present to continue the work for peace in Korea, and beyond, for the peace of the world. After a brief video presentation entitled “True love for others is the path to harmony and unity,” highlighting True Parents’ lifelong for peace, True Mother was welcomed to the podium. God gave us a portion of responsibility but Adam and Eve, through self-centeredness, made the mistake of the Fall. Since then God has walked the lonely path to restore fallen human beings. Along its course, those who practiced virtue were raised up to lead the others. God raised up Israel as a chosen nation over 4000 biblical years. People had been yearning for the Messiah; then Jesus was sent by God. Jesus, as the only begotten son, should have met the only begotten daughter and he and his bride should have become the True Parents of humanity. But this did not work out. Mother explained that the Christianity was placed in the position to restore this. It took 300 years for Christianity to make a beginning. Christianity then spread across the world. Yet Christianity does not understand its mission entirely. The essence of Jesus is true love. Giving, giving again, and forgetting you have given. But looking at Christian civilization, they have not all kept an attitude of giving. All the nations in Europe have technology and knowledge, and are economically strong. But internally, they had not managed to learn to live for the sake of others and thus they have not prepared for Jesus’ second coming. This mission transferred to the Christians in Korea, but they also have not succeeded. Christians in Korea have not understood God’s providence sufficiently. You need to understand that with True Parents’ Holy Wedding in 1960, the Messiah was here. If people had recognized this in 1960 it would have been easier. There are many more people now, so it is a bigger job. But if people unite with True Parents, there will be a future for humanity. In 2016 the International Association of Parliamentarians for Peace was launched in many important places, and has drawn many members of parliament in many countries. In February, 700 congressmen came Korea for the conference. I told them they should be messiahs to the people in their countries. We began IAPP in 120 nations. How painful and difficult a path our Heavenly Parent has endured. In the Bible it is described as 6,000 years, but human history is much longer than that. Your wish is the reunification of Korea, to live in a nation of unity and prosperity. But this wish cannot be realized through political or ideological means alone. You need True Parents to solve this problem. Korea has been blessed as God’s homeland. Therefore, all of you must show through your actions that this really is the nation where God and True Parents can dwell. You must be able to stand proud before the entire world. You must be the light of Asia. This is the era of the Pacific-Rim Civilization. From here, peace will expand throughout the world. The Pacific Rim Era is one of living for the sake of others and centering on True Parents. Before Heavenly Parent, and with a heart of filial attendance, let us offer glory and happiness. Until we have accomplished this, let us march forward! To realize peace in Korea we will work actively. We will practice a life of true love to make peace. We will set in motion a movement to restore values. Three resounding cheers of Eok-mansei brought the event to a cheery conclusion, and Mother departed the stage accompanied by members of the True Family. All people are fallen due to original sin, and it is True Parents' fundamental mission to save them. The centerpiece of this mission is the providence of the marriage Blessing, which eradicates original sin and fallen lineage. The marriage Blessing is the ceremony through which the evil lineage stained by Satan, is converted to the lineage of goodness rooted in God. It is the important ceremony that restores the order of love with God at the center, and eradicates the disordered love engendered by Satan through the Fall. The providence of the marriage Blessing, under the auspices of the True Parents, is the starting point for realizing the ideal of one family under God. The reparation to receive the Blessing of marriage is perhaps best done by using the tools Jesus gave us to liberate ourselves from Satan. Jesus taught us The 3 Great Human Virtues for the fallen world to use to liberate us from Satan. Jesus' teachings placed us perfectly at the foot of The Tree of Life. He opened the door to the 1st blessing of individual perfection. This lifestyle should be pursued by both the man and woman preparing to be blessed in marriage. It is best if blessing candidates be admired by all people as people of good character. Additionally, they must fulfill basic requirements, such as maintaining purity, receiving education, testifying, fasting and offering devotions. True Parents have also said that a couple should commit to one another only after obtaining parental consent. Rev Sun Myung Moon, as a young 15 year old praying on a Korean mountain-top on Easter morning in 1935, was asked by Jesus, to take on the mission of bringing God's 2nd Blessing, the Blessing of Marriage, to humankind. After a long difficult road, he and Dr. Hak Ja Han Moon were victorious in assuming the mantle as the True Parents of Humankind. In 1960 True Parents opened the new chapter in the history of human salvation through the marriage Blessing. The marriage Blessing is of great significance, because it replaces Satan's lineage with God's, and recovers the order of love rooted in God. The Blessing benefits society by offering the opportunity for people to enter into cross-cultural marriages, which contribute to the realization of one world under God by breaking down barriers between nations, races and religions. The marriage Blessing ceremonies began with 3 couples on April 16,1960. Then the 36 Couples, 72 Couples, 124 Couples and 430 Couples were blessed on the tribal and national levels. Through the next several ceremonies, including the Blessings of 777 Couples, 1,800 Couples, 2,075 Couples and 6,000 Couples, the holy marriage Blessing became an international event. At the 6,500 Couples Blessing, largely between Korean and Japanese spouses, for the first time the majority of the couples were international. From the time of the 30,000 Couples Blessing, the Blessing expanded to a global scale, with the inclusion of simultaneous international satellite Blessing ceremonies. Hand in hand with the marriage Blessing, True Parents carried out the pure love movement and the true family movement on an extensive scale. These seek to offer fundamental solutions to the global problems of youth immorality and family breakdown. The ideal world of creation can be realized only when the pure love tradition sets the standard for the order of love among young people and then expands to transcend religion, nation and race. In other words, God's Will can be realized when the marriage Blessing expands, gains popularity and takes root. True Parents have made it clear that blessed families need to be concerned about and live for their tribe, their people, their nation and the world before their own family. When a blessed husband and wife honor each other as the person who stands in the position of God, they set the example for those around them. As such, blessed families are to take the lead in the restoration of their tribe, their nation, the world, and all of heaven and earth. They need to live together experiencing the love of brothers and sisters. They are to establish the tradition of community life through which all people can live together and love one another, transcendent of nation, race and religion. True Parents said that through the marriage Blessing, we need to establish the traditions of true husband and wife, true parents, true children and true siblings, with true love at the center. They particularly emphasized that true love incorporates the rights of inheritance, equal status and shared participation. So the ideal of the kingdom of heaven can be realized when people inherit the tradition of the true love of God. The reason the Bible is the greatest among the scriptures of the many religions is that it introduces God as the Father, the Parent of humankind. This is the foundation of the Christian faith. Next, it refers to Jesus as God's only begotten Son. The phrase "God's only begotten Son" means that Jesus is the first person who could receive the fullness of God's love. Jesus said, "I am the Son of God," "God is my Father," and "I am the only begotten Son." The only begotten Son is the Prince of Heaven who can receive God's first love. Among God's sons, he is the only one who can receive God's first love and receive it in its fullness. Next, there must be the only begotten Daughter. The Bridegroom is the only begotten Son; the Bride is the only begotten Daughter. God has been looking for the persons who can represent Adam and Eve whom God had lost. The Bible calls Jesus the Second Adam. It calls Adam the tree of life. Thus, Jesus is the one who came in place of the tree of life that had been lost. However, he could not complete his original mission because he was not able to welcome the day of his wedding, when both God and the Son could rejoice. That is why he left earth with the promise that he will return. The day will arrive when God and Jesus rejoice together. The day will come when they can openly express their heart filled with 6,000 years of bitter pain and sorrow. The day will come when the coming Lord can establish the bond of lineage linking God to His sons and daughters. Suppose that when Jesus came to earth as God's only begotten Son, he had not died on the cross. Since he was God's only begotten Son, God surely would have sent His only begotten Daughter to him. God has searched for 2,000 years to find the Bride. Jesus emerged as the true Son, but there is no mention of the true Daughter anywhere in the Bible. That is why God's Will was not realized. True Father, "Mother is the Owner of my Heart"